I’ve been hard at work developing some of the new features for Soliloquy, and I think you will be pleased with some of the results. You will have a choice between the normal link for the slide or to use a video link. The field will support any type of YouTube or Vimeo link, and if that field is set, Soliloquy will automatically format the link correctly to embed it within the slider. Some extra features will be available in conjunction with this, like being able to determine the width and height of your video (even if it is different from your slider dimensions). You will have a thumbnail image in case you decide to use the Thumbnails Addon which is coming after the next major release of Soliloquy. The image will be used as a fallback in the event that your video does not load properly, no longer exists or is incorrectly linked. And finally, it always annoyed me trying to figure out how to pause/restart a slider that has an embedded video playing. I’d get asked about it every time I had a project for a client, and well, I need this feature just as much as you do for my own projects. So I’ve gone ahead and built in support for pausing/playing the slider whenever a video is running. Once the video is started, the slider will pause, and when the video is completed or paused, the slider will resume. You won’t need to worry about a thing – just set your video link and Soliloquy will do the rest. 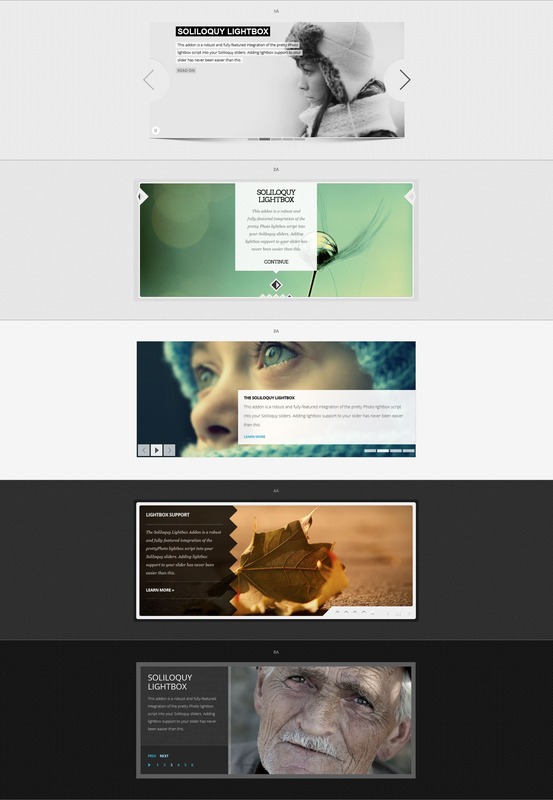 Another popular request is that Soliloquy be able to dynamically create a slider based on featured posts of sorts. This has culminated in the Featured Content Addon (you can view a screenshot of how it looks when you create a new slider here). Once activated, you will be given a choice between the normal slider or a featured content slider. Should you choose the featured content slider option, you will be given “steps” from which you can create your slider. This addon is powerful and allows for some pretty advanced queries when determining what content should be present in your slider. It’s enhanced by the Chosen JS library to make selection options easier and more accessible. This Addon will be available with the next major release of Soliloquy is available. Talk about some good looking designs! This Addon will also be available when the next major version of Soliloquy drops. Finally, robust documentation will be available for the next major release of Soliloquy. You will be able to have a quick reference for hooks, filters and how to create your own Addons using them. I believe this next major release will be a turning point for Soliloquy. With the new Addons plus some enhancements to Soliloquy itself, it will truly be the best option for a slider plugin on the market. It’s seamless integration with the native admin UI, easy-to-use uploading/drag-and-drop sorting, powerful Addon support and endless customization with hooks and filters, you simply cannot find a better solution for a slider plugin than Soliloquy. This is very exciting as I am having this very issue with my site. When will you be releasing this? I need this right now for my client. How can I make this happen!!!!! 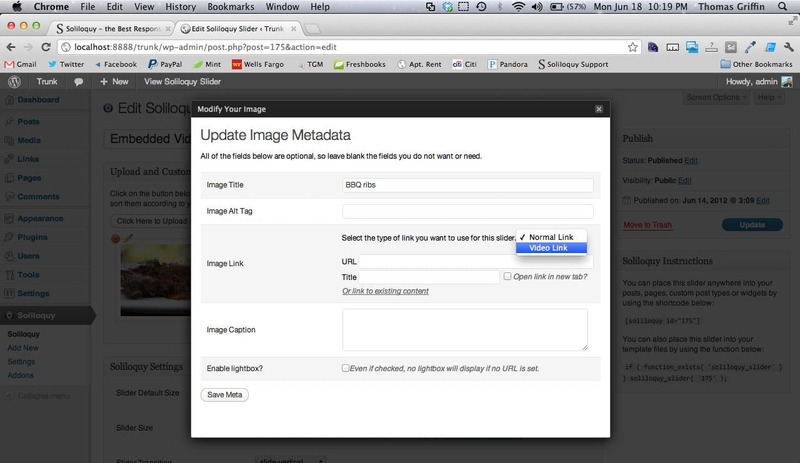 Make sure you have purchased Soliloquy, and you can do this by selecting the Video Slides option.